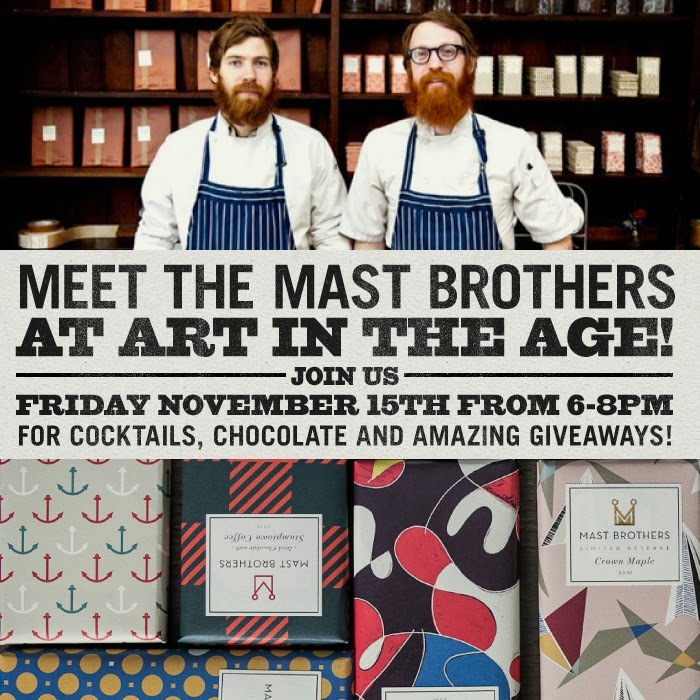 the mast brothers, pioneers of the bean-to-bar craft chocolate movement are coming to art in the age this friday, november 15th, from 6:00PM-8:00PM for an exclusive signing of their book mast brothers chocolate: a family cookbook where they share their unique story and recipes for classic american desserts like chocolate cookies, cakes, brownies, bars, milkshakes, and homemade whoopee pies. high street on market will be providing tasty chocolate pastries served alongside boozy hot chocolate made with mast brother's chocolate and art in the age organic spirits, and topped with spodee marshmallows from zynnie bakes. to celebrate, we're also hosting a giveaway with five winners who will walk away with an assortment of goodies courtesy of mast brothers chocolate, art in the age, and spodee. art in the age is located at 116 north 3rd street, philadelphia.